For those of you who have been reading my blog since the very beginning, you may (or may not) have noticed that it has been quite some time since I’ve written a post about weight loss. There is quite a good explanation for this: I haven’t been losing weight. In fact I haven’t been in the game at all. Those of you might recall a post I did quite some time back where I discussed the idea of the lightning strike. That the only way one can truly make a difference in one’s life is if one feels it from the pit of their soul that they want to change – that they can, without resistance, commit to it. Sadly for the past several months this fire has been extinguished. In August of 2011 I was at my lowest weight that I can ever recall: 203 pounds. Last week I weighed in at 225 pounds. Sobering to say the least. I have been, quite simply put, not in control… until this week. Though I may have been out of the game for a while, you can be assured that the issue is never far from my thoughts. I think all of us who struggle with weight will agree with me when I say that no matter what state of mind one is in, good or bad, the struggle will always be present. When I think back on these last few months I realize that I have been frustrated with the fact that I seem so unable to commit. I kept thinking back on my days at USC, in the prime of my weight loss efforts. I was nearly a vegan, going to the gym nearly every day, losing an average of 3-4 pounds per week. Sweets and terrible foods didn’t even phase me. Focused and unflinching, I lost nearly 40 pounds in the span of 4 months. Now here I am, back up to 225 and unable to hold on to any convictions for more than a few days – what the hell is wrong with me? Why can’t I get back the way it was when I was at USC? Last weekend I attended a concert in West Hollywood and sat with a good friend of mine, Jeff. Somehow we got on the topic of health and weight, which compelled Jeff to show me his latest iPhone find: an app called “LoseIt!”. 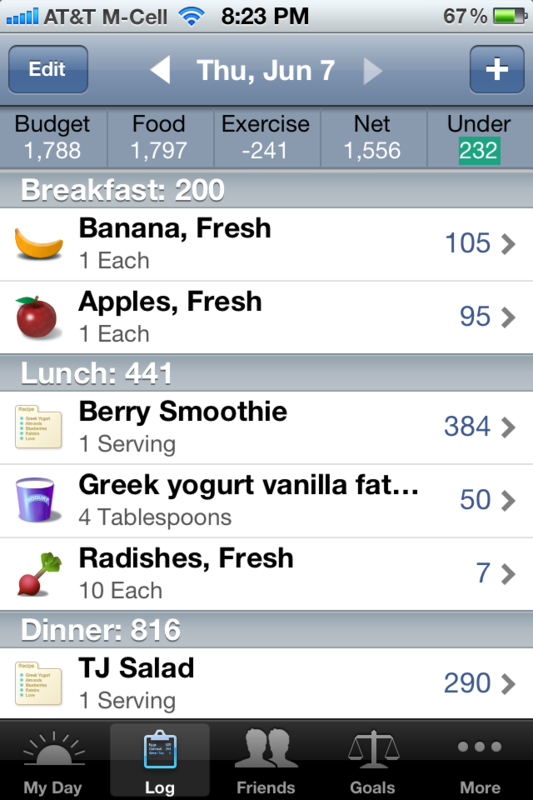 Totally free, Lose It is essentially an electronic food diary that allows you to keep track of all the calories you are putting into your body. I have to confess, I have never really been good at any kind of diary, much less one about food. The fact that I’m able to sustain this blog is quite miraculous in itself (shows how much I love all of you readers!). For some reason I always felt that keeping track of one’s calories wasn’t really a sustainable practice. Instead, I took the more organic (aka hippie) approach in which I just relied on common sense and good knowledge to eat the proper foods in proper quantities. And it really worked… until it didn’t. Seeing Jeff pitch this app and all its incredible features, like the barcode scanner that allows you to simply scan a barcode and up pops all the nutritional information and calories, I thought, what the hell, let’s give it a shot. Well, it turns out this app was my missing link. After the first two days of using it the numbers on my scale were already going down. I was nothing short of astonished. This means two things: I realized that back at USC I made some very drastic changes to my diet, for example giving up milk, cheese, and meat. That with a little exercise was enough to make the pounds fly off. But guess what? Not only has my body changed since then, but my life has completely changed. Clearly I am no longer in the frame of mind to make such a drastic change, nor will my body respond as well to it. Instead, I needed to take all the knowledge on nutrition, plant based life styles, raw food, etc, that I had accumulated and place it in a new context: good old fashioned calories. What this app has done is provide me with a way to have liberty with what I’m eating while still forcing me to be responsible for everything I am putting into my body. I think a trap that many of us fall into is the “these are healthy so I can eat 12 of them” mentality. While that may work for things like radishes or carrot sticks, it doesn’t work for most. Avocados, for example. I love avocados. Love them. They are natural and super healthy. I will often eat one of them as a snack. What this new app made me realize is that while it is healthy, it is still 250 calories. When you’re looking to come in under 1800 calories a day, that’s nearly half a meal. Damn. It also works in the reverse way. If you’re wanting to indulge on a slice of pizza or some froyo, that’s totally fine, as long as it’s within your daily calorie budget. While of course one will get the best results by keeping balance between quality and quantity, sometimes you need a goddamn cheeseburger. And that is ok. But the real lesson I want to convey here is that our lives change and we have to change with them. Sometimes we have to change our methods and seek out new sources of inspiration – a fresh new lightning strike. I will be making weekly posts about my efforts and I definitely want to hear all about yours. Post comments here or, if you want to give LOSE IT a try, add me as a friend using my email address: thestarvingartistfood@gmail.com. Even if you don’t have an iPhone you can use the free service on their website, loseit.com. It’s time, friends! Don’t give up! Good for you! I use the WWDiary for Android but I hear the Lose It app is very similar. Stay the course!